Indian Coast Guard Navik (Domestic Branch) Result Check Here. Indian Coast Guard INC Chilka Result 2018 Check Here. Indian Coast Guard Notification is out. 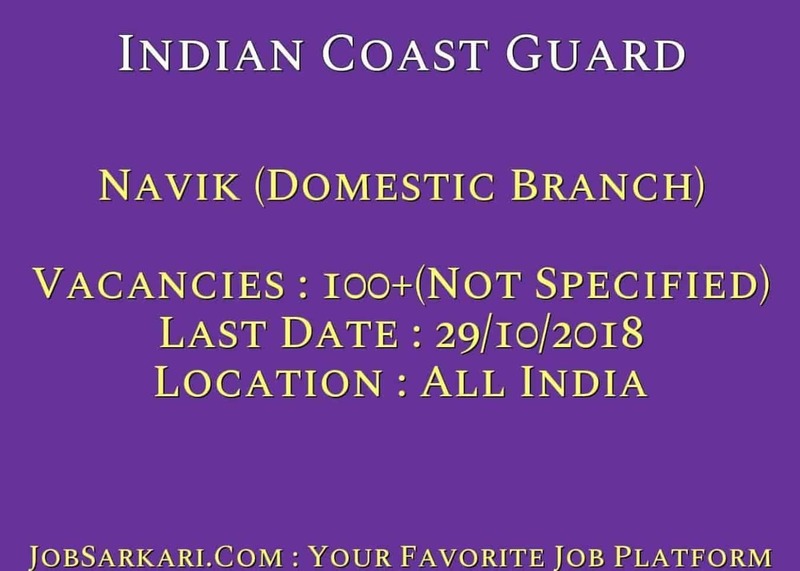 Indian Coast Guard is recruiting for 100+(Not Specified) Navik (Domestic Branch) Posts. You can check Indian Coast Guard - Indian Coast Guard last date, download Indian Coast Guard notification, visit Indian Coast Guard official website and check other Indian Coast Guard Vacancy details.Complete Vacancy and recruitment Details about 100+(Not Specified) Navik (Domestic Branch) vacancies in Indian Coast Guard are provided below by JobSarkari.Com only for you. Last Date of Apply Online. 29/10/2018. Last Date of Submit Complete Form. 29/10/2018. Date of Admit Card. 08/11/2018 to 15/11/2018. Date of Exam. November 2018. Cook. Candidate Must Have Passed Class 10th With Minimum 50% Marks(45% for SC / ST). 100+(Not Specified). Steward. Candidate Must Have Passed Class 10th With Minimum 50% Marks(45% for SC / ST). 100+(Not Specified). Candidate Must Have Born Between 01/04/1997 to 31/03/2001. Age Relaxation. 5 Years For SC/ST And 3 Years For SC/ST. 1. 1.6 Km Run Must be Completed in 7 Mins. 1. On Merit Basis (Short Listing). 1. Candidate Need to Apply The Online Mode. 3. Candidate Need to Fill All The Details in Application Form And Need to Upload All the Mandatory Documents Like Cast Certificate, Age Proof, Passport Size Photos And Signature As Prescribed Size And Format. 4. Candidate Need to Apply Online Before 29th October 2018. Q. What is the Last Date For Indian Coast Guard Navik (Domestic Branch) Vacancy ? A. Last Date for Indian Coast Guard Navik (Domestic Branch) Posts is 29/10/2018. Q. What is the Form Type of Indian Coast Guard Navik (Domestic Branch) Recruitment ? A. The Form Type for Indian Coast Guard Navik (Domestic Branch) Posts is Online. Q. How many vacancies are available in Indian Coast Guard Navik (Domestic Branch) Posts ? A. 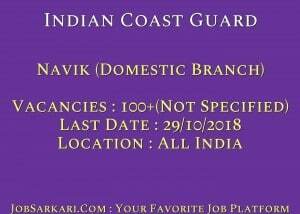 There are about 100+(Not Specified) Vacancies in Indian Coast Guard Navik (Domestic Branch) Posts. Q. What is the Full Form of Indian Coast Guard ? A. Full Form of Indian Coast Guard is Indian Coast Guard . You Can Apply For This Post..